Aku: You three are ready. (Cackles menacingly.) Such fine specimens you are. You have that blackness in your souls that entices me. With that blackness, is that strength you three bear in combat. Will you pledge your loyalty to me your Master of Darkness and Shogun of Sorrow? Butch: Yes, my lord. We pledge our allegiance to you and no one else. Aku: What is your destiny? Boomer: We will honor you and serve your domain with all that we have. Aku: Yes! And what have I taught you three? Blossom: Anyone who dares defile your realm shall be killed by our own hands and their corpses will be given to you to feast on. Aku: Will you stay with me and fight by my side? Butch, Boomer, and Blossom: Yes, my lord. Aku: Will you obey my every command? Butch, Boomer, and Blossom: We will, my lord. 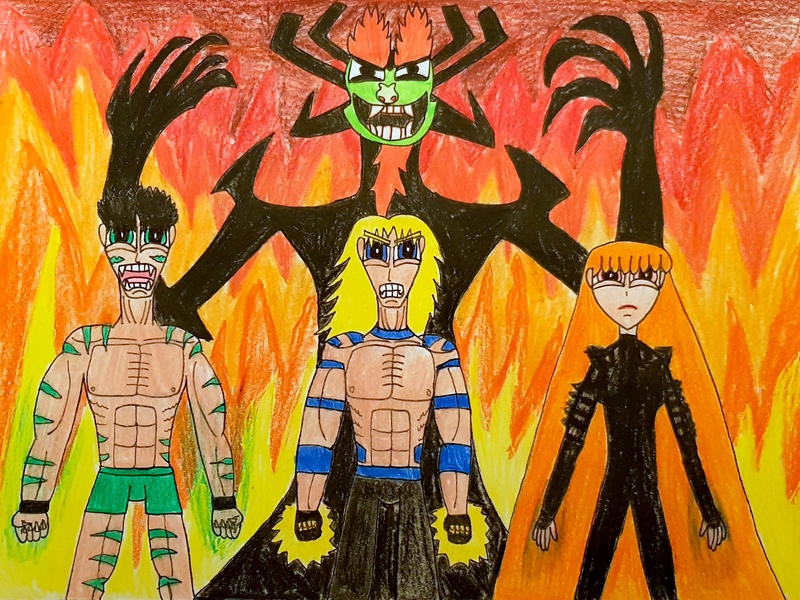 Aku: Butch, Boomer, will you bring your most beloved brother Brick and take out his heart, lungs, and liver as a sacrifice for me? Boomer: You are not the only one, Butch. You may have shown your fraternal love and kindness to him, but I for one cannot wait to see him squirm like the vermin he really is. I will gladly kill him. Aku: Excellent! And Blossom, if you are successful in not only bringing Brick and your sisters as my sacrificial lambs, will you, Boomer, and Butch stay and rule with me? Blossom: I thought you would never ask, my lord. My husband, my lover, and I will be glad to rule side by side with you. Aku: Splendid! The time has come. Go and do my bidding! Butch, Boomer, and Blossom: Yes, my lord! This piece of Aku, Butch, Boomer, and Blossom or Akublossutchoomer fanart, which is my contest entry for Powerpuff-Nation’s 2018 Halloween contest, is dedicated to Sheila aka syahilla, Phoebe Burick aka TheRandomCat88, Marshy aka Smol-Marshmallow, Ryan R. aka Rayryan90, Khalil aka sharkkson, and Icebluelink who celebrated their birthdays several days ago. So, Sheila, Phoebe, Marshy, Ryan, Khalil, and Icebluelink, I hope you guys had amazing, awesome, fantastic, and thrilling birthdays. I wish you a lot of love, happiness, joy, serenity, and greatness in everything you do as artists and as people. I would also love to dedicate this to all of the Blossutch, Blossoomer, and AkuBloss shippers out there and even those who ship Aku with both Butch and Boomer as a BroTP. I hope you all enjoy this piece of work I have for you. Man, this has been in the making for the longest time. I have been playing with the idea of putting in the legendary, demonic villain Aku from Samurai Jack, which is pretty much the best Cartoon Network show I have ever seen in my entire life, in my Team Xtreme headcanon. With this character, I also thought it would be fun to add an element of a dark prophecy looming over three of my most favorite characters Butch, Boomer, and Blossom, which in turn is my OT3 for life. When mixing these elements together, something extraordinary popped up from my brain, especially with all of the times I have rewatched and rewatched my most favorite Teen Titans 2003 episodes featuring Slade and eventually Trigon. Those episodes were “Apprentice Parts 1 and 2” with Robin being Slade’s apprentice, “Aftershock Parts 1 and 2” with Terra being Slade’s apprentice, and “Birthmark” and “The End Parts 1, 2, and 3” with Slade having some connection to Raven’s prophecy and featuring the main big bad Trigon. I am very sure you can see where I am going with this. And yes, it is really enjoyable seeing Butch, Boomer, and Blossom go to the dark, diabolical, demonic side. It makes the plot focused on them thicken. Aku is essentially an amalgamation of Slade and Trigon with a hint of Brother Blood, in my Team Xtreme Headcanon. Aku is not as cool and collected as Slade, but he can surely make one crap his pants off when dealing with him. You will not find me shipping Aku with Blossom romantically. Oh, no. He serves as a sort of dark mentor and grandfather figure to Blossom. He has done his fair share of creeping up to her room and giving her ominous symbols nearly placing a curse on her, thus threatening her with her comrades’ lives if she does not join him in the dark side. For Team Xtreme’s Team Mom that is surely a scary thought. I mean having to be in such a bargain with the devil himself just for the sake of her dear comrades could be a most harrowing choice. It also does not help matters that her darlings for life Butch and Boomer are dragged into this, seeing that they love Blossom with every bit of their being. At least for Aku, the more the merrier. So, he gets to appoint The Baron of Berserk, The Fleet Athlete, and The Commander and the Leader to be his apprentices in order to spare the likes of Brick, Buttercup, and Bubbles being slaughtered by the Shogun of Sorrow. Though, he also wants their blood as well when all is said and done. Now, when it comes to Butch, Boomer, and Blossom, I have this to say about them in this scenario. Each of these three has a bit of Robin, Raven, and Terra in their systems and in their beings. Think about it, as I explain what I mean for each character. Butch is the second eldest like Robin from the Teen Titans and he does function as a big brother to his teammates, though his impulsiveness gets in the way on several occasions. Yes, I know Butch fits Cyborg’s personality a little bit more because he is the muscle and Brick fits Robin’s leadership almost to a T, but the impulsiveness and drive he has kind of makes him similar to Robin. Much like Raven, Butch is really tough and strong in his own way and he can have moments where he can bear a certain coolness like her, but control is not really his strong suit. However, much like Raven, anger is the one strong emotion these two have in common. Speaking of control, Butch and Terra kind of share that weakness. While Terra had problems controlling her earth-manipulating powers, Butch has problems controlling his own urges to fight to the point where he is an untamed being out for blood and never holding back. At least Butch has his marvelously special power of creating energy-absorbing force fields, which in turn is the special gift that he can control pretty well. Boomer, much like Robin, is very much the one who wants to do the right thing, as opposed to Brick and Butch. He is a lot more upright than his brothers and his heart is in the right place and that is all the comparisons I have for Boomer with Robin. Where comparing Boomer with Raven is concerned, well, at least they have some insecurities that make them a little bit more fleshed out and they are capable fighters. However, I can compare Boomer with Terra on several occasions. This is mainly in virtue of their insurmountable powers what with Terra’s being connected with earth and Boomer’s being connected with raw energy. The fact that both Boomer and Terra have these extraordinary powers just makes them all the more formidable. Terra has the ability to manipulate earth whether it is solid or mud and she can control the absolute heck out of it. Boomer has the ability to make objects out of raw energy like the one time he made an electric baseball bat that glows a yellow hue of gold with lightning. The one comparison I can spot with both Boomer and Terra is that at least he is a little bit more controlled with how he uses it. Moreover, when it comes to their personalities, they are actually pretty sympathetic, aside from just being strong, capable fighters with unique powers. Finally, there is Blossom. I swear that comparing Robin to Blossom is pretty much a piece of cake. They are obviously leaders who are strong, capable, and smart and will not take crap from anybody even if it means going through Hell and back to survive. Sure, the both of them bear the fatal flaw of being bossy, kind of domineering, and being nags, but they still mean very well and they want to make sure that their team stays strong no matter what they do and no matter what circumstances they face. The similarities Blossom bears with Raven is that she is cool, calm, and collected in battle and that she thinks with logic, thus keeping her emotions under control on many occasions, see her final battle in “Stuck Up, Up and Away” for good evidence. As for comparing Blossom with Terra, it is obviously their elemental powers that truly make them stand out what with Blossom being ice and Terra being, of course, earth. Their powers are deemed as special because that is what makes them unique and I am very sure people would die to have those elemental superpowers of ice breath and earth manipulation. Sure, they initially did not show control, but with time they at least mastered their special skills in their own means. Personality-wise, both Blossom and Terra do have their share of insecurities, though Blossom’s are not always as bad as Terra’s. Now, that I talked about how Butch, Boomer, and Blossom can compare with Robin, Raven, and Terra, let’s talk about their outfits. Butch, in this scenario, screams Raven for me. The tiger stripes on his body, as well as his getup, could certainly remind one of Raven and her birthmark in her Season 4 appearances. In this scenario, it is his more beastly side that gets more exposed by Aku, thus making him more animalistic than he already is. The slightest provocation directed at Butch can mean oncoming death, especially when faced with his signature Tornado Punch, which has also gotten stronger thanks to Aku. Boomer’s getup is similar to Terra’s when she becomes Slade’s apprentice but he obviously shows more skin. The bands he has on his arms, neck area, and shoulders, as well as the gloves, are meant to control his lightning powers and his every move when necessary. Of course, Aku can control when Boomer has to use his lightning powers when he is in a sticky situation. Blossom’s outfit is pretty similar to Robin’s apprentice outfit for Slade. Only this time, she does look like one of Aku’s assassins or daughters, thus heightening that assassin nature this getup has. Just as long as Blossom stays loyal and obedient to Aku, she does not have to worry about being hurt by him by having her battle suit work against her. Let’s also face it. When one combines Butch’s Tornado Punch with Boomer’s lightning powers and Blossom’s ice breath, one also has to be extremely prepared for blustery blizzard complete with lightning, thus bringing destruction in its path. 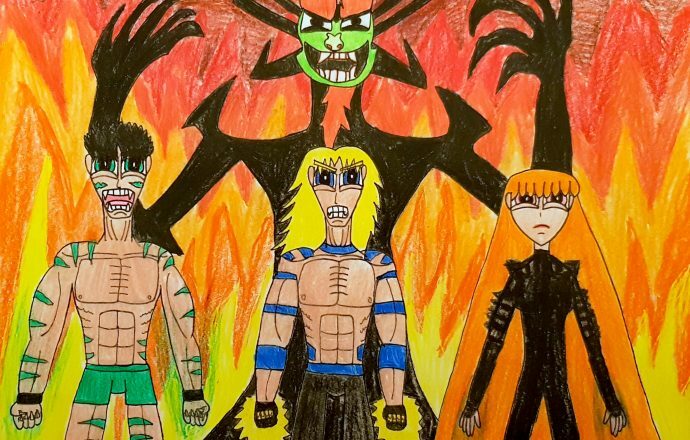 Well, I hope you all had fun with this piece of fanart involving Aku, Butch, Boomer, and Blossom. It was truly fascinating and enjoyable to have a lot of inspiration, especially to make Aku the master and make Butch, Boomer, and Blossom his most loyal apprentices/henchmen. Just remember to not mess with these four, lest something terrible happens. Happy Halloween. Aku from Samurai Jack belongs to Genndy Tartakovsky and Cartoon Network. Butch, Boomer, and Blossom from The Powerpuff Girls belong to Craig McCracken and Cartoon Network.